A joint, monthly report released by Adameer, The Prisoner's Club, and Al Mezan Center for Human Rights has revealed that 431 Palestinians were arrested by the occupation forces in the month of September 2017. Of these 431, 98 were children, 11 were women, and 3 were journalists. 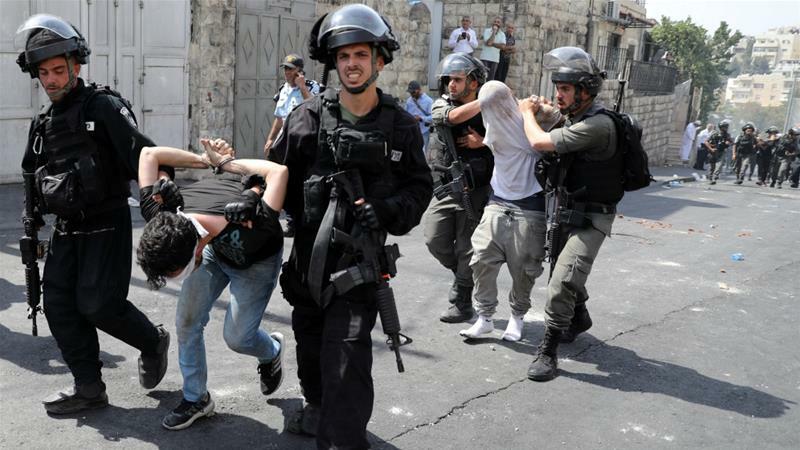 133 were arrested from Jerusalem governorate, 60 from the Hebron governorate, 45 from the Nablus governorate, 40 from the Ramallah governorate, 38 from Jenin governorate, 28 from Bethlehem governorate, 15 from Tubas governorate, 10 from Salfeet governorate, 9 from Tulkaram governorate, 7 from Jericho governorate, and 6 from Gaza. In addition, the report indicates that the number of Palestinian prisoners in Israeli jails reached 6300 prisoners, including 57 female prisoners, 10 minor girls, approximately 300 children and 450 administrative detainees. In the month of September, the occupation authorities issued 68 administrative detention orders, of which 24 were new orders. Despite the fact that this represents a dip in the number from last month, the rate of arrests still constitutes a trend of mass incarceration of the Palestinian people. The figure means that the occupation forces were arresting roughly 14 people a night for the past month. Each month, these figures paint a picture of where the occupation believes there to be the most need for deterrence and control. In keeping with the popular uprising during the month of July, the Jerusalem area remains a focus due to the belief that new points of tension can spontaneously present themselves. In addition to Jerusalem, there has been increased activity in Hebron both in regard to protests and occupation forces moving deep into Palestinian controlled territory with impunity. In addition to figures, the report also deals with the increasing use of home arrest in regard to East Jerusalem children, and the mass arrest campaign currently taking place in Kifel Hares, in the southwest of Nablus governorate. The four organizations strongly condemn Israel's gross and systematic violations of international law, and its disregard for the rights of Palestinian detainees. We also condemn the continuing occupation authorities' disregard of the legal guarantees provided by international legal regulations, particularly the Standard Minimum Rules for the Treatment of Prisoners 1955, and other international declarations and conventions guaranteeing the rights of prisoners and detainees. The four institutions also call upon the international community to intervene urgently in regard to the fulfillment of its legal and moral obligations towards the population of the occupied Palestinian territories and to take effective measures to compel the occupying state to ensure respect for their basic human rights. We also call upon local, regional and international groups and allies to activate solidarity campaigns with prisoners, with the aim of putting pressure on the occupying state.